After seven and a half years, LTP is coming to an end. Our final post will be on January 15 and we’ve been spending our final week going in to memory mode and the big picture on all things Northwestern Athletics. If you’d like to read the post announcing why I felt it was time to close you can read Closing Time part one here and part two of “Closing Time” here. Please note, we’ll be leaving the site up so you can access the archives and all of the content that started in June of 2007. Just so every one is aware, we’ll be keeping the entire site up and even more archive focused as we shutter day-to-day blog posting here at LTP. We’ve got some work to do to make that happen, so bear with us if everything isn’t quite good to go next week. One such Wildcat distraction of rabbit hole proportion is the LTP “N Flag Project” we started years ago. I asked for fans to send in visual proof of their Wildcat pride by taking photos of the Northwestern “N flag” flying proudly whether it was at their house or on a road trip. We then integrated the photos in to a Google Map to show off the location and just like that we had a steady stream of amazing shots from all over the globe from you. We have 49 states (no Connecticut if you can imagine that), dozens of stadium shots and dozens and dozens of countries on the board. I could do one photo a day and we’d go for more than a year. It’s actually not a bad idea considering almost every photo came with an email back story that I just found fascinating. Please don’t be offended if yours didn’t make this list. The below is a small sample of the” best of” and I’d love to show them all. Amy and Stephen, both NU Class of ’99, put some purple in Barrow, Alaska, the northern most city in the United States. 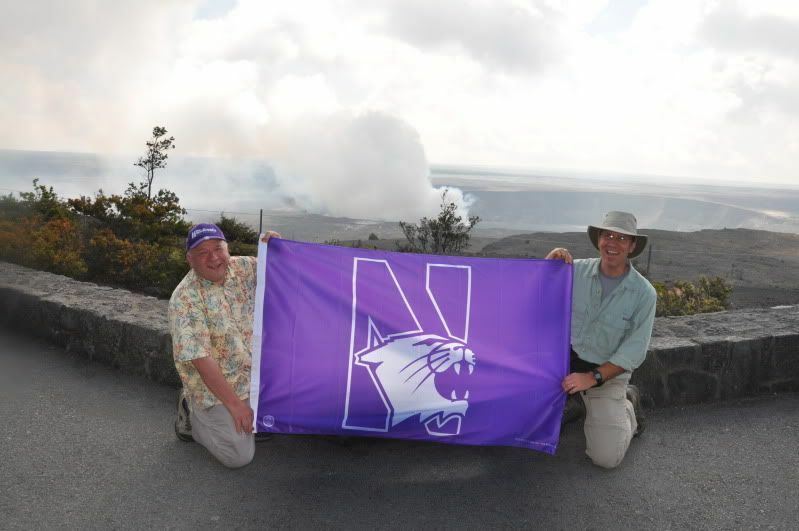 Wildcat fans ventured even further north like this shot way north in Alaska near the arctic circle. 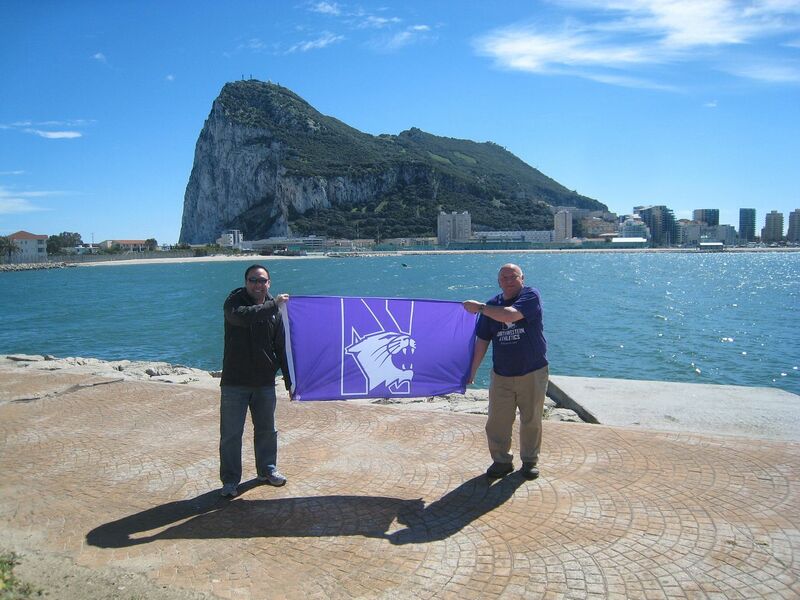 The Wildcat flag flew in Anaktuvuk pass, Alaska, north of the arctic circle thanks to Ernie K and his wife. ‘Cats fans in 2009 in Antartica! Most courageous…Michael and Cody flashing the purple pride in Pyongyang, DPRK, the capital city in North Korea. And a few stadium gotchas…. and the wishful thinking of the Rose Bowl…. And the best prank of all was one fan who was able to sneak in to Cal’s stadium and hoist the Wildcat purple…. And a fantastic shot of a wedding in New Mexico that I wish I could blow up to show you the happiness in the shot. Thanks to every one over the years who submitted photos and great stories that accompanied the emails. We’ll be keeping the map, along with everything else, up for your review. Thanks for the memories. Honored that multiple views were selected of the Purple in my state. Should note though that Barrow is in fact north of the Arctic Circle.